If you’re from the Midwest, it’s hard to imagine the colors at Ghost Ranch. Even if you’ve seen Georgia O’Keefe’s paintings and dozens of beautiful photographs. My Ohio home, lush as it is, looks faded in comparison, dully monochromatic. I feel like I’ve been colorblind until now, and am suddenly cured. 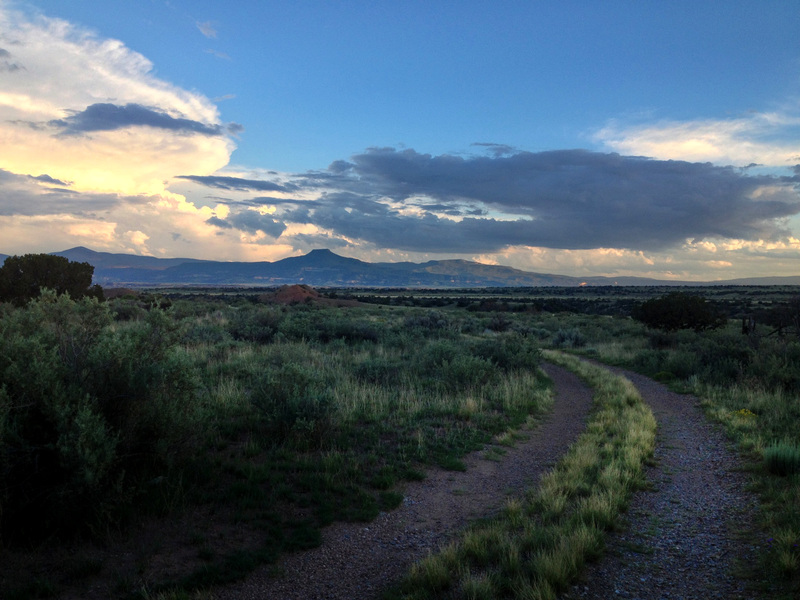 New Mexico is red-orange and bright sienna and a million greens— dark pine, gray sage, springy alfalfa and the soft green cottonwood clouds seaming the arroyo behind Staff House and the dining hall. And blues: robin’s egg morning skies that burst into turquoise afternoons that deepen to cobalt above far-off mountains that range from wet denim to teal to slate. Blues so deep you want to dive in and float. Blues that make me forget for a moment my love of oceans. Perched on the Welcome Center porch, I have a clear view of Pedernal, the mountain Georgia O’Keefe claimed from God for her very own. Cerro Pedernal is his full name —I’ve decided this mountain must be male— which in Spanish means Flint Hill. Like everything here, Pedernal changes by the hour, but right now he is crowned with clouds and scrimmed by rain, a looming, watery, flat-topped shadow in the near distance. Closer in, the sandstone and gypsum cliffs form a backdrop to kids on bikes and the changing kaleidoscope of residents and workers that zigzag between the buildings. The cliffs are a multi-toned tapestry of gold, peach and terracotta red dotted with dark juniper knots and etched with shadows forming a thousand faces. There are spirits here, in the shadowy mountains and cliffs. I feel them, silently watching those of us who come and go, seducing people like me from flatter, grayer places. This entry was posted on August 13, 2014, 11:32 pm and is filed under musings, photography, travel, Uncategorized. You can follow any responses to this entry through RSS 2.0. You can leave a response, or trackback from your own site. What a lovely and accurate description of the beauty that is New Mexico. That state has the most jaw-dropping white, billowy clouds. I was raised in Michigan but have lived in Colorado for over half my life. I never tire of the wide blue sky and the subtle colors of our high desert. I think it must be the clarity of the air, unfiltered by humidity, that gives the crispness to our native colors. Thanks, Sammy D! I agree, the clear, thin air must be part of the magic. Beautiful. Beautiful! On a drizzly Ohio River Valley morning that is even more monochromistic than usual, this reads like a breath of fresh, dry air and brilliant sunshine. Your color description of blue reminds me of Mrs. Miniver examining a kilim rug (have you read that out of print book? I think you’d like it). Thank you–I will have to see if the library has that book! Loved this. Felt like I was right there with you. Wish you had been there, Mary Ellen. You’d have loved it there for sure.